The Roubaix 28 hour race started in 1954 and has been held every year since, making it one of the oldest continuously run race-walking races in the world. When I competed last year this was my longest race to date and only my third race of 100 miles or longer. Going in to this year’s event I had completed four races of 100 miles or longer in the previous 6 months and was in excellent condition, both mentally and physically. My goal was to complete at least 200km and ideally a little further than that as the current New Zealand 200km race-walking record was 27 hours and 40 minutes and it would be the perfect ending to my racing year if I could beat that time. As with last year, there were only two English speaking walkers in the race. Suzanne Beardsmore, who was coming off the 6 day race at Privas in August, and myself. 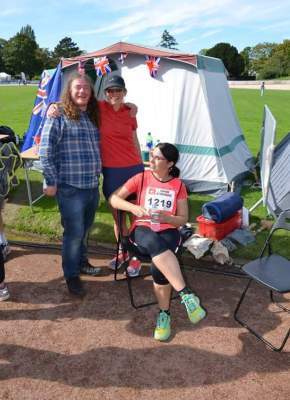 We were being supported by Suzanne’s partner Jim and fellow centurion race-walker Sarah Lightman, and there were two teams of GB walkers competing in the 24 hour relay event which accompanied the main race. 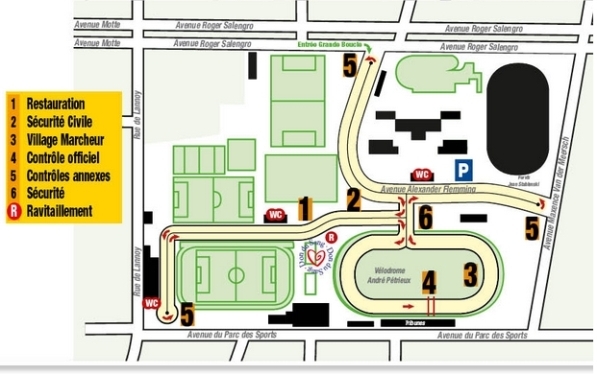 Jim, Sarah, Suzanne and I traveled to Roubaix by car on Friday, the day before the race, and set up our tent beside the track on Friday afternoon before joining many of the other individual and relay competitors for dinner at a local restaurant on Friday evening. 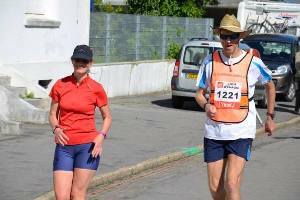 One of the things I love about the French ultra-distance race-walking circuit is that at every race you make new friends and meet old friends again. And with walkers coming from all over Europe you often find yourself communicating in very basic English, French, or maybe even in sign language. 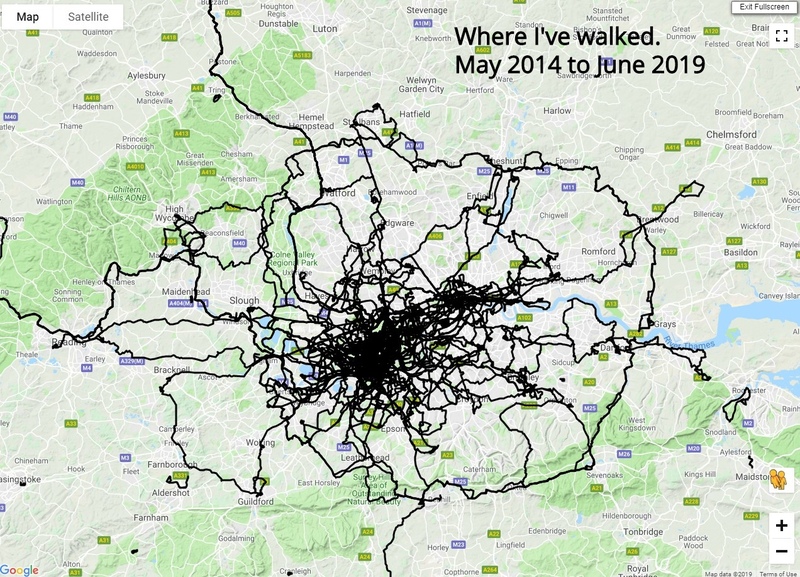 This year was no exception, with walkers coming from New Zealand, England, France, Holland, Russia, Germany, and several other European countries. On Saturday morning we visited a supermarket to purchase some last minute food supplies and then set up the rest of our equipment trackside to ensure that Jim and Sarah would be able to provide the best possible support. A job they did perfectly. The race itself started in the town square in Roubaix at 11am so we left Sarah at the track and traveled the short distance in to Roubaix with Bernard Six (most of the photos in this race report are thanks to Bernard), a local resident who has been supporting the English race participants for as many years as anyone can remember. It was a beautiful sunny morning driving from the track to the town centre, a big improvement over the wet weather from Friday, but no sooner had we arrived at the race start and the heavens opened with a torrential downpour that lasted about ten minutes. During this time we sought refuge in a local café, had a drink and made use of their toilet to relieve pre-race nerves. Fortunately, once the rain stopped we didn’t have any weather problems again – until we arrived back in England on Monday afternoon! The first 18.5km was a tour of Roubaix which is a fun way to start the race. We started outside the town hall and, in my case, followed the leaders through the often narrow streets of the town. My aim for this stage of the race was to keep the pace at between 7:30 and 7:45 per kilometre (12 to 12 ½ minutes per mile) and whenever my pace increased above this speed I would deliberately slow down and let myself drift slowly back through the field, being careful not to allow the gap between myself and the walker in front to become too big as I may need to rely on them for directions. There was only one time that I went around a corner to find the street in front of me empty but fortunately most corners were well marked with green arrows so I didn’t have any problems. 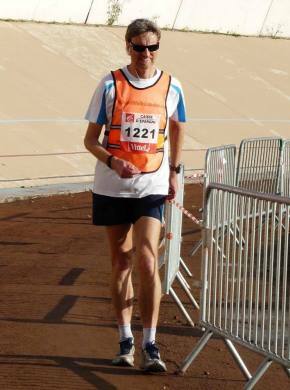 I arrived at the Parc Des Sports, where we would be racing over a 1.982km circuit for the remainder of the event, 2 hours and 23 minutes in to the race and in 31st pace, and then started to race! For me this was probably the most uneventful race of this distance that I have ever done. I’m not complaining. The opposite actually. The race went perfectly. I didn’t have any really low points during the race or any real problems. I simply walked around the circuit lap after lap after lap. At the end of each lap I would pass the electronic timer and then see my name on the TV together with my cumulative distance and current position in the field, and as the distance grew, the position slowly came down. There was never a time when my position went up, meaning that throughout the race I was passing people which gave me huge motivation. And just past the TV screen either Jim and/or Sarah would be waiting to feed and/or water me. It was a 25 ½ hour eating and walking festival. And there was also an aid station approximately half way around the circuit which I would often grab another drink or a banana from as I walked past. 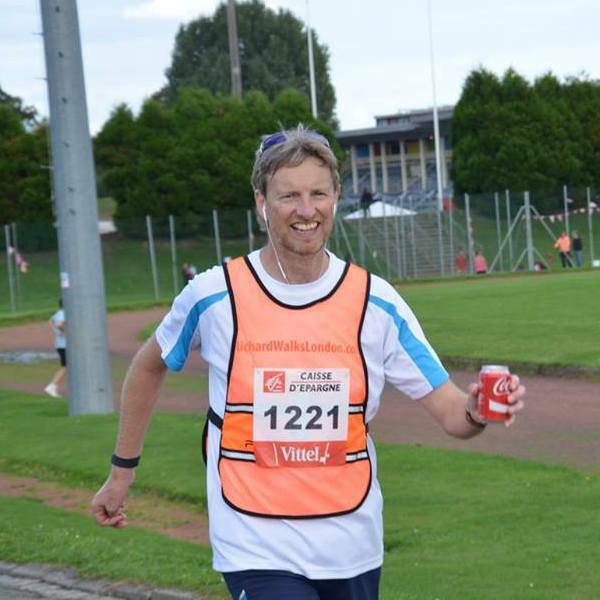 Unlike recent races where I have tried to remain sugar free for as long as possible (and in the Thames Path 100 I completed the whole 100 miles without any sugary food or drink at all) I had decided that I would fuel myself mainly on coke, fruit and biscuits along with ham and crisps, and at least every second lap (every 4km) Jim or Sarah would hand me something to eat. I was in paradise. Having a great race. Something to eat at least every half hour. What more could I ask for? My lap times were extremely consistent too. Averaging around 15:30 to 16:00 per lap in the early stages and then slowing a little once it was dark, but with a fastest lap of 14:48 and a slowest lap of 18:08 (I stopped for a quick toilet break) I can’t complain, and most laps of the 94 laps I completed were in the 15 to 17 minute range. The circuit consisted of about 300 meters on a compacted ash track which would have been very messy if it had rained throughout the race, but turned out to be a great surface other than the occasional small stone that would bounce up in to my shoe – I had to stop three times during the race to remove stones from my shoes but this wasn’t a major issue. And the rest of the circuit consisted of three separate out and back sections on a tarmac surface, with one being dead flat and the other two being slightly uphill – but only with a few meters of elevation change so nothing to worry about. I found myself getting into a rhythm and the laps flew by. And with the three out and back sections we got to see the other athletes throughout the race which was fantastic, and occasionally I would use the opportunity to calculate how many minutes or seconds I was behind someone and then check again on the next out and back section to see whether I was closing the gap. This became especially useful in the last few hours of the race. I passed 100km shortly after midnight in a time of 13 hours and 18 minutes. Not my fastest time for 100km in a race of this distance but something I was completely comfortable with. 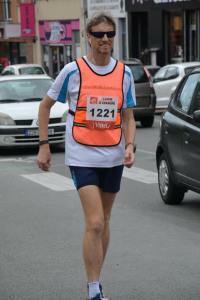 My aim had been to complete the first 100km in 13 hours flat but I was happy with 13:18. 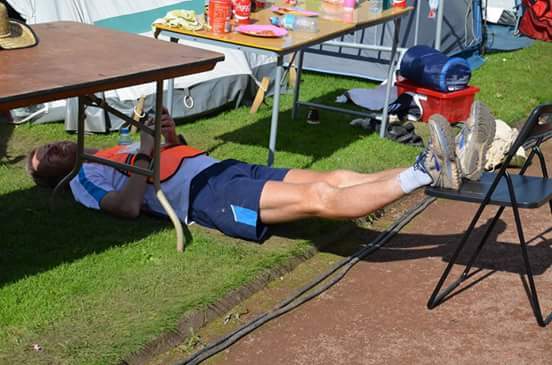 And I arrived at 100 miles in a 28 minute PB of 21 hours and 45 minutes, and was still going strongly and still moving up through the field. From memory I was in about 14th place at this stage. 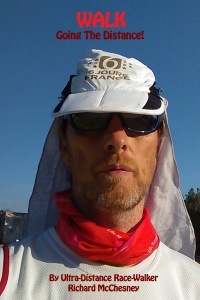 I wanted to achieve a decent distance over 24 hours too as I wanted to qualify for the prestigious Paris-Alsace race which is by held each June and entry is by invitation only. Last year my best distance for 24 hours was 172km and the cut-off for invitations appeared to be 173km, so I wanted to beat that distance. I didn’t actually intend to do Paris-Alsace next year though. It is an extremely brutal race held over 5 days on the roads of France with at least one stage being very mountainess (and I don’t enjoy hills as we found out at Chateau Thierry earlier this year) and not something that I want to do until I am a little more experienced. But at the same time I wanted to prove to myself that I could qualify if I wanted to do the race. And I managed to complete 176.6km in 24 hours by which stage I was in 10th position overall. 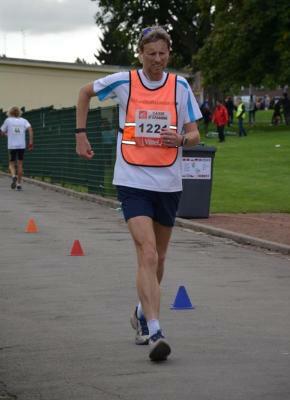 And immediately after the race the Paris-Alsace organiser invited both myself and Suzanne to compete next year. Suzanne has accepted but I have declined the invitation. Next on the agenda was to get through to 200km in less than 27 hours and 40 minutes. Having passed 100 miles in 21:45 I had almost six hours to complete less than 40km and thought that would be a breeze. But for some reason I slowed a little in the next 10km and by 24 hours I knew I still had to concentrate on the job at hand if I was to achieve my goal. 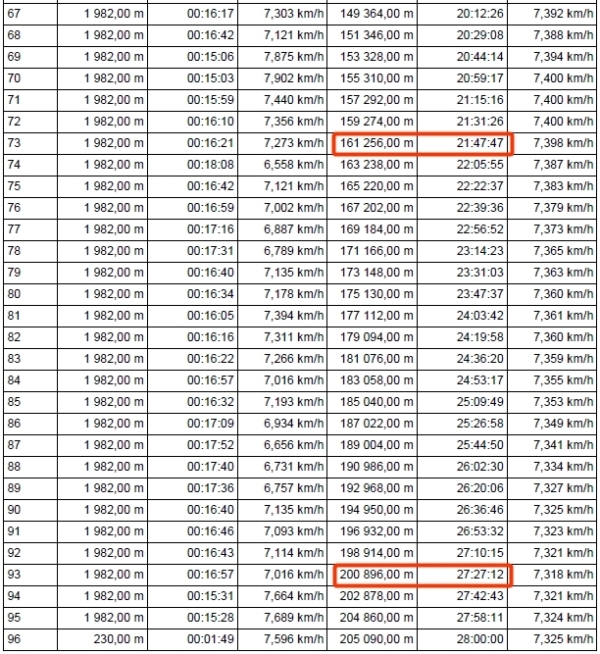 Because the circuit was a 1.982km lap which we had started after already walking 18.5km, the 200km mark was not at the end of a lap and I was actually going to have to cover 200.9km in order to get an official time for 200km. At the speed I was doing 900 meters equated to about 7 minutes, so I actually had 3 hours and 40 minutes to cover 24.3km. Easy to achieve at the start of the race but I had already been walking for 24 hours! This is where Sarah comes in to the story big time. I don’t remember exactly when, but at around 24 hours Sarah started pacing Suzanne for a while as Suzanne was struggling. They did 12km together in total so I guess it must have been sometime after 25 ½ hours in to the race that Sarah then started to pace me. Initially she would walk with me for one lap, let me walk a lap alone, and then walk with me another lap. The company was great and my pace picked up just enough to give me confidence that I could get the record. Jim continued to feed me regularly too and it got to the stage where I was eating every lap as well as drinking coke at the aid station half way around. Things were going really well. I moved into 8th place on the 200km lap and completed that lap (200.9km) in a new New Zealand 200km record time of 27 hours, 27 minutes, and 12 seconds! The problem was that two laps before reaching 200km we worked that the guy in 7th place was only six minutes in front of me, and on the same out and back section during the 200km lap he was only three minutes in front of me. We also worked out that it was possible for me to complete another two full laps after finishing the 200km lap meaning that there was a very strong chance that I could move in to 7th place before the end of the race if I kept pushing it. So no time for celebration other than to grab a can of coke from Jim and keep on walking. It turned out to be an aniti-climax though as half way around the penultimate lap I had almost caught 7th place when he stopped at the toilets! Must have been desperate to stop with less than 25 minutes still to race. But I had built up momentum and I kept the pace going right through to the finish with two of my fastest laps of the race. 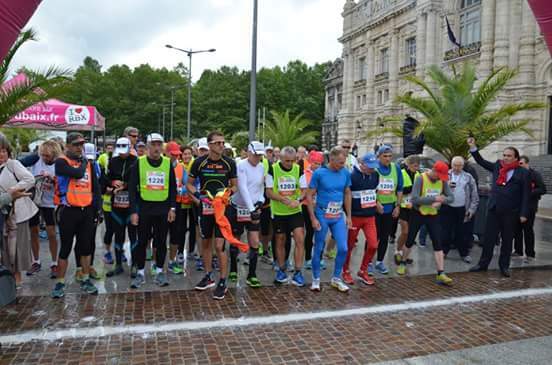 In the end I completed a total of 205.090km in the 28 hours and finished in 7th place. By far the best ultra-distance race performance of my life. 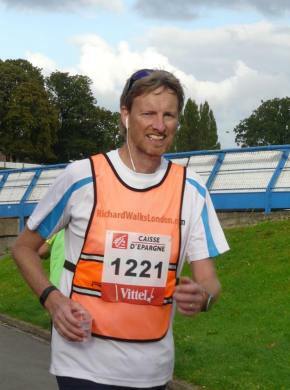 Firstly, I wore my Fitbit during the race and was staggered after I finished to find that in each 14 hour half I had walked an almost identical number of steps – 112,500 steps in the first half and only 500 less steps in the second half. 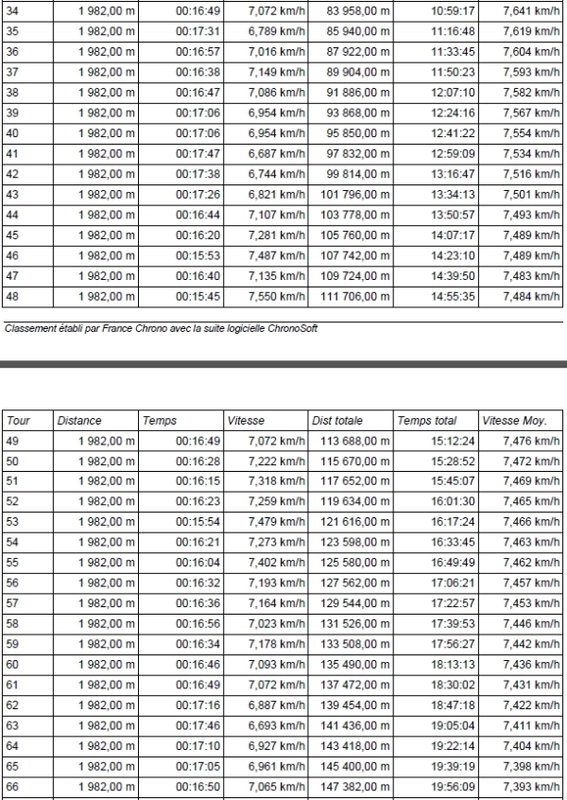 Looking at my lap splits I walked almost exactly 105km in the first 14 hours and 100km in the second. Only 500 less steps but 5,000 meters less distance. When I calculate my average stride length, less than 500 meters of the the 5km slow down in the second half was due to the reduced number of steps. The remaining 4.5km slow down was due to a 4 centimeter reduction in average stride length! It’s incredible to think that if I had maintained the same stride length throughout whole race I could have walked almost 210km. Next, my lap splits. Once we were onto the circuit I completed 94 laps in 25 hours and 34 minutes. 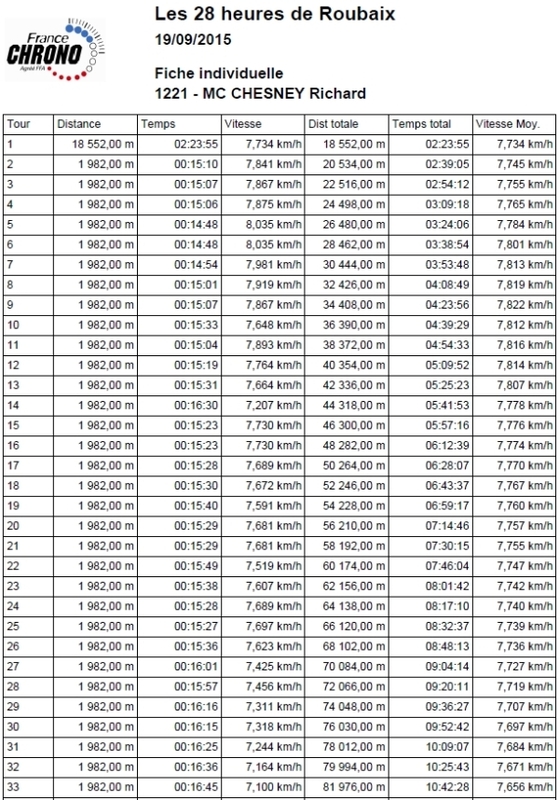 An average lap time of 16:19. My fastest lap was 14:48 which I did twice (laps 4 and 5) and my slowest was one of my toilet stop laps – lap 74 which took 18:08. 30 laps took between 15:00 and 15:59 and 44 laps took between 16:00 and 16:59. 52 laps were slower than my 16:19 average and 42 were faster. My 68th and 69th laps were my 7th and 5th fastest. This is because I was lapped by the race leader just after 151km and decided to sit on his shoulder for a couple laps – I lasted 2 ½ laps before decided to ease the pace a little. You can see the little peak in my Day 2 Fitbit graph above at 7am when my steps per 5 minutes increased by about 30 steps for a short period. And outside of laps 69 and 70, my last two laps (laps 93 and 94) were my fastest since lap 24, almost 20 hours earlier! I passed 100 miles during lap 73 and 200km during lap 93. Both are circled. And lastly, when I look at the distances recorded for each athlete at 24 hours and then at the finish, I covered more distance in the last four hours than everyone but one person – 28.4km! It’s over! And these feet have just carried me 205km! In all my races and long training walks this year I have been coating my feet in 2Toms Anti-Blister powder with great success. Very few blisters compared to usual other than the Privas 72 hour race where my feet were badly damaged by blisters (see photos here). So for Roubaix I decided to use both 2Toms Anti-Blister powder and Injinji toe socks. The result: one very small blister on the small toe of my left foot (one of the three toes that lost toenails at Privas) and some blistering on the sides of both heels. Also a small hole on the big toe of my left foot (the big toe of the sock, not my foot). I was wearing the Injinji Performance Liner sock which is much thinner than the normal Injinji socks and I think the idea is to wear another thin pair of socks over the top which is something I will do next time as I think that would prevent the heel blisters. Overall I was happy with the result. That is it for 2015. I have completed six races in total. Five of them have been 100 miles or further and the other was a marathon. All six races were within the last six months so I think I deserve a break. The plan is to take between 6 and 8 weeks of almost total rest and then start working on some race-walking technique before starting a buildup to my 2016 races. 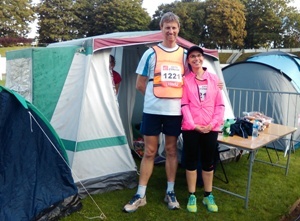 Lastly, I want to thank Jim and Sarah once again for their fantastic work in supporting both me and Suzanne (who finished 3rd female with a distance of 185.629km). 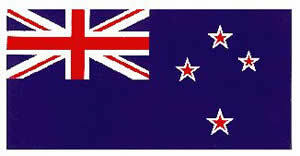 Obviously it is your job to support Suzanne, Jim – given that you live together. But I wouldn’t have achieved the distances and times I did without the support and encouragement you gave me during the race. Thanks.